The Mach Speed section in Kingdom Valley. Mach Speed sections are a feature exclusive to Sonic's gameplay in Sonic the Hedgehog (2006 game). The game engine itself drives Sonic forward at breakneck pace, leaving the player only in control of left/right movement and jumping. Kingdom Valley, rushing towards Aquatic Base. These sections were notoriously difficult to control for many players. Crashing into any obstacles at all would result in Sonic losing rings - and often send him careening (or breakdancing) right off the side of the level - which would thwart many efforts to achieve an S-rank on a stage. 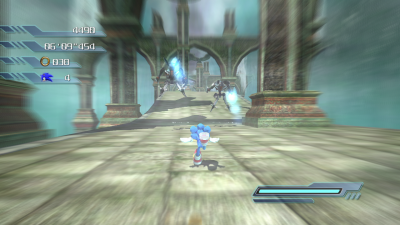 Similar sections appear in Sonic Colours (Wii), but they are much easier to control because they use the Quick Step mechanic introduced in Sonic Unleashed. Mach Speed sections make an official return in Sonic Lost World, however, they have been retooled slightly in order to avoid control problems. This page was last edited on 28 February 2017, at 11:21.